Amber Balkcom, Jan Moran, Dajuan Bowman and FSU President John Thrasher at the 2016 Jim Moran Scholar reception Tuesday, Oct. 18. The Jim Moran Institute for Global Entrepreneurship in the Florida State University College of Business recognized Amber Balkcom and Dajuan Bowman as the 2016 Jim Moran Scholar recipients Tuesday at a private reception on campus. Jan Moran, FSU President John Thrasher, College of Business Dean Michael D. Hartline as well as family and friends honored Balkcom and Bowman at the Pearl Tyner House. 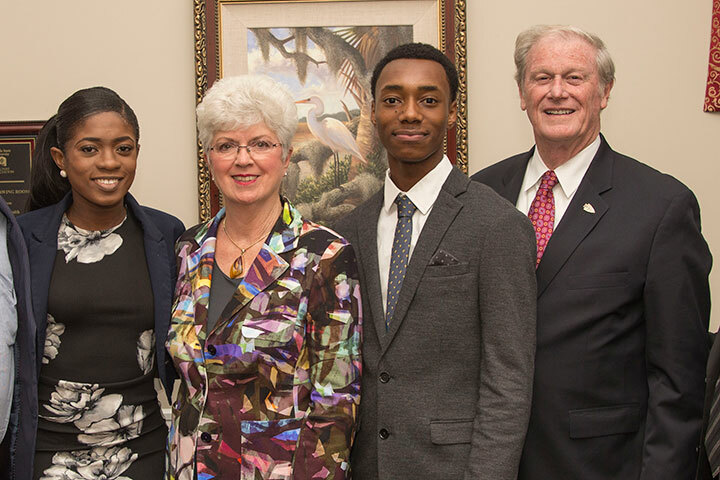 The Jim Moran Foundation, in partnership with Florida State University, annually recognizes two Jim Moran Scholars — African-American high school students from South Florida and North Florida who are role models and have received admission to FSU with an identified financial barrier. Both scholars receive a four-year, needs-based scholarship with funding provided through the Jim Moran Institute for Global Entrepreneurship. Amber Balkcom, the 2016 North Florida Jim Moran Scholar, graduated from Robert E. Lee High School in Jacksonville, Fla. As a high school student, she volunteered with the children’s ministry at her local church, held leadership positions including golf team captain and National Honor Society treasurer, and worked more than 30 hours per week. She plans to major in health management, policy and information with a minor in psychology. Dajuan Bowman, the 2016 South Florida Jim Moran Scholar, graduated from William H. Turner Technical Arts High School in Miami with a 4.5 GPA and medical assistant certification. As the student government parliamentarian, Bowman organized his school’s senior/freshmen mentor program. He was also active in the school’s SHAPE program (Students Helping Achieve Philanthropic Excellence), where he earned more than 160 community service hours. Bowman will explore several majors before deciding which one to pursue. For more information about the Jim Moran Institute for Global Entrepreneurship, visit www.jmi.fsu.edu. A 1995 contribution from Jim and Jan Moran and JM Family Enterprises established the Jim Moran Institute for Global Entrepreneurship at the Florida State University College of Business with additional support through the years. Since 2011, further enhancements to the Jim Moran Institute and its outreach have been made possible by Jan Moran and The Jim Moran Foundation.